A good friend of mine celebrated his 30th birthday this weekend, so I decided to bake him a cake. I wanted it to be simple and sweet and special--something that would make the transition into a new decade a little easier. I remember turning 30 myself and thinking that I would feel incredibly old and panicky about the whole thing. Instead, it turned out to be a real turning point for me, in the best ways possible. I grew up a lot, got rid of some bad habits, picked up yoga, started running in earnest, started a company with my best friend, got into a serious relationship, left a serious relationship, decided to finally start working towards my MA, and learned a heck of a lot about myself in the meantime. I'm happier now than ever before, and I hear it only gets better from here. That's the funny thing about aging--people dread it but it gives just as much as it takes. The more time you spend on this earth, the more wisdom, clarity, consciousness, and serenity you get. Getting older is a beautiful thing. Preheat oven to 350 degrees. Butter a 10-inch Bundt pan. Dust with flour and tap out excess. Whisk together flour, baking powder, baking soda, and salt in a medium bowl. Cream butter and brown sugar with an electric mixer on medium-high speed until fluffy, 3 to 4 minutes. Add eggs, one at a time, beating well after each addition. Beat in 1/2 cup maple syrup and the vanilla. Add flour mixture in three additions, alternating with the sour cream and beginning and ending with flour; beat until just combined after each addition. Scrape batter into prepared pan. Bake until golden brown and a tester inserted into middle of cake comes out clean, 35 to 40 minutes. Let cool in pan on a wire rack 15 minutes before turning out onto rack to cool completely. Just before serving, whisk cream until soft peaks form (I used an electric handheld mixer for this). Add 2 tablespoons maple syrup and whisk until soft peaks return. 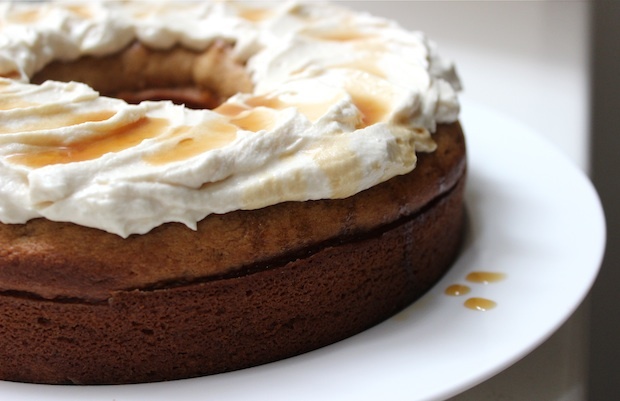 Spoon whipped cream over cake and drizzle with more maple syrup. Serve immediately. The perfect afternoon sweet treat with a cup of coffee - yum! I needed to read this so badly- yesterday was my birthday and I cringe at the thought of being another year older. I hope you're right about age giving as much as it takes!